In Spring Blossom tapestry we see a portiere tapestry of spring blossoms and birds inspired by a Chinese panel painting from the 18th century. The birds and flowers are poised against the blue grey background and shows the delicacy and poignancy of Chinese art. 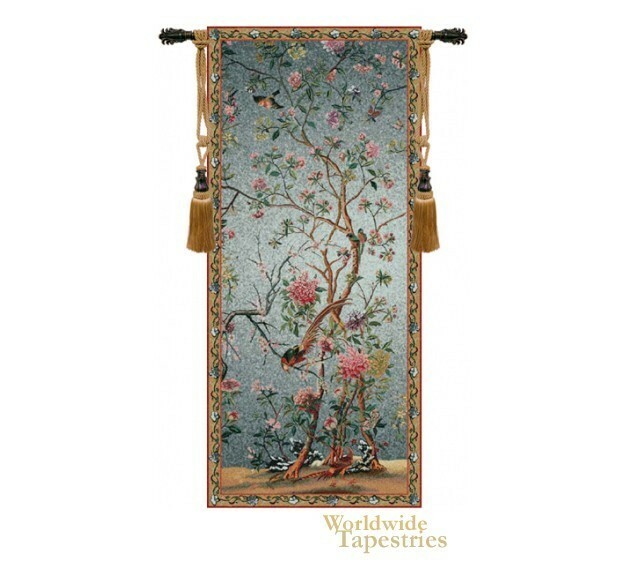 The Spring Blossom tapestry is backed with a lining and a tunnel for easy hanging. Note: tapestry rods and tassels, where pictured, are not included in the price. Dimensions: W 28" x H 65"